Suitable for use as Beauty Lamps and for those suffering sight impairment or weak vision. with 12.5 cm 5 dioptre Glass Lens. (#CAPG008W). Features: Round 12.5 cm lens made from Glass. 5 dioptre Magnification which equates to 2.2 times. Fluorescent round bulb (22 watt). Handle on lamp for easy movement of Lamp head. Arm extends for easy reach. Wall Bracket available optionally @ $21.50. Popular Mag Lamps with Beauty Salons. Specifications of power - 240 volts, 50 Hz, 22 watt. 1 year warranty applies to all Magnifying Lamps. Other items to compare with. 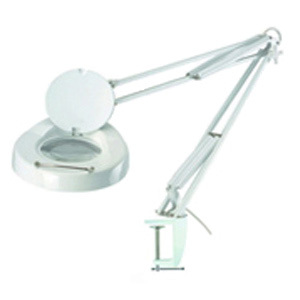 CAPG009W White Beauty Salon Magnifying Lamp with Floor Stand. CAPG002B Black Magnifying Lamp with 5 legged heavy duty Floor Stand for Beauty. CAPG004W Magnifier on Floor Stand with Light . This is a large Magnifier. CAPG005 Magi Lamp with 5 dioptre Glass Magnifier Lens plus small 12 dioptre section and adjustable arm. CAPG005LED Portable White LED Magnifying Lamp with 60 diodes. CAPG006B Mag Lamps with flexible arm - Black. CAPG008B Black Magnifying Lamp suitable for salon practitioners involved with beauty. CAPG010 Mag Lamp with 5 dioptre Glass lens and 12 dioptre additional small 12 dioptre removable lens. CAPG040 LED Magnifying Lamp with 108 diodes - Large lens makes this suitable for those with eye sight impairment and wanting to perform tasks like reading, knitting, sewing or other handicraft. CAPG041 LED Magnifying Lamp with 108 diodes sits on a heavy duty 5 legged mobile Floor Stand. CAPG070 White Desk Mag Lamp. CAPG090 Beauty Salon LED Magnifying Lamp with 90 diodes. CAPG091 Purchased mainly by Beauty Salons and technicians involved with eyelash extensions. Salon LED Mag Lamp using 90 diodes plus Floor Stand. CAPG001WL Round 5 dioptre Glass Magnification Lens. CAPG003WL Rectangle 5 dioptre Glass Magnification Lens. CAPG005L Small circular Light Bulb (12 watt). CAPG052W White Clamp for Magnifiers. CAPG053A 4 pin bulb (9 watt). CAPG054 22 watt Fluorescent bulb for Beauty. CAPG056 Square Fluorescent bulb (28 watt). CAPG057B Bench top black bracket. Any Magnifier Lamp delivered Australia wide. Payments processed securely through PayPal. Payments can also be made via Cheque or Bank Transfer. More details can be provided by calling (02) 6162 1950 or email us. * Models available cover Desktop, Floor Stand and Clamp based units. * Inspection of items in our Canberra store welcome.